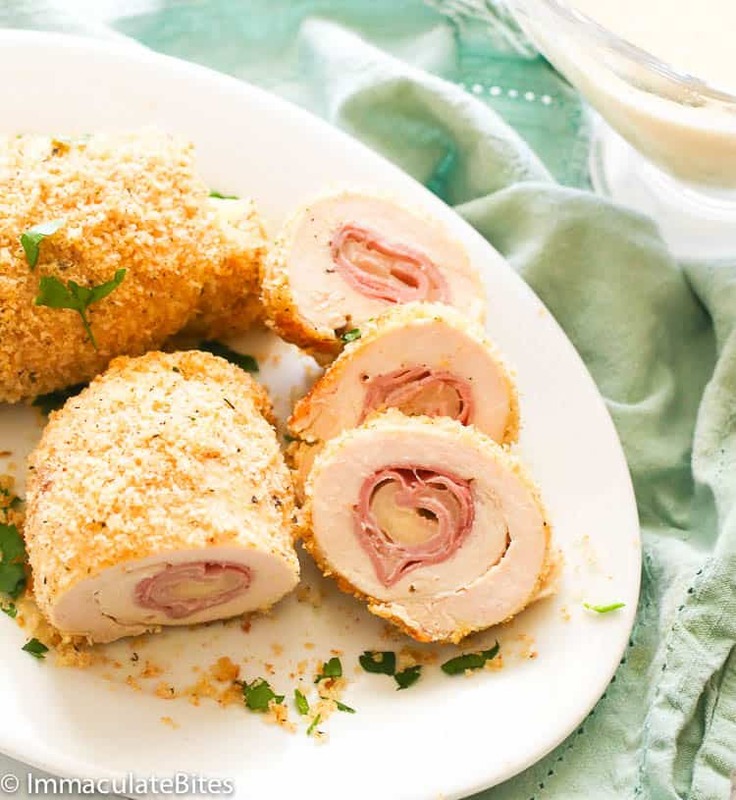 Chicken Cordon Bleu – easy and classic French dish made with ham and cheese-stuffed chicken breast then coated with beautiful crunchy breadcrumbs. Perfect dinner on its own or with salads. And it’s baked! Oh I’m so excited to share this chicken recipe with you all! It’s one of my son’s favorite chicken dish and definitely one of those that can be on weekly rotation. And who wouldn’t love to have ham, cheese and chicken all in one? It’s a classic dish that never gets old! Cordon bleu is a French term for “blue ribbon” which are only worn by members of the highest order of knighthood instituted by Herny III of France. This term also applies to food that are prepared by outstanding cooks to a very high standard. It’s a dish of meat wrapped or stuffed with ham and cheese, breaded and pan-fried or deep-fried. Chicken breast, veal and pork are among the popular meat used in this recipe. How to cook chicken cordon bleu? Forget about deep-frying or pan-frying, this chicken cordon bleu here is as good as the fried ones except that they’re baked! Yes yes! And baking these beauties here make it rather easier compared to frying it. 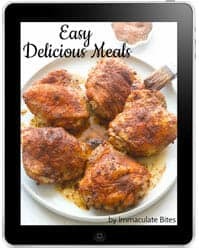 To make this dish, you start off by lightly pounding the chicken breast to flatten out a bit and for it to cook through evenly in the oven.Then you season both sides of the chicken to kick the flavors up a notch. Once you’re done seasoning all the chicken meat, you can now proceed to the assembly part which is super easy. First, lay two thin slices of ham on top of each other and place as well two slices of cheese on top and roll it up. This will help stop the cheese from melting out. Second, place the ham and cheese roll up on top of the chicken breast on one edge and start rolling it up, securing the edges with a toothpick. Dip the chicken in the egg mixture and roll it next in the breadcrumb mixture, pressing lightly to help the crumbs stick well to the kitchen. And lastly, transfer it to a greased pan and bake. Voila! Fancy chicken cordon bleu in no time. Take note, that you may toast the breadcrumbs over stovetop or in the oven. Toasting the breadcrumbs will help us achieve that desirable and lovely crunch (which we all do want 😉 ) that complements well with the molten cheese on the inside and the juicy meat. Can you freeze uncooked chicken cordon bleu? To answer the most-asked question, YES, you can freeze and bake it later. Just prepare the chicken as directed to, but DO NOT bake. After the assembly part, simply cover the chicken tightly with an aluminum foil and freeze up to 3 months. When ready to bake, thaw the chicken cordon bleu in the fridge, heat up the oven, uncover the chicken and pop it in the oven and bake. As you all know by now, this recipe here is so versatile. You can serve chicken cordon bleu as party appetizers in pinwheels or as a main course. Actually, my son loves eating it as it is while we the grown ups prefer serving it in slices to top our green salads. You can also serve it with veggies like green beans, asparagus, brussel sprouts or a creamy mashed potatoes. And oh, let’s not forget it’s creamy, smooth and luscious white sauce that adds another layer of flavors for this dish. You totally got to include this chicken cordon bleu in you weekly meal plan. Preheat oven to 350 degrees F. Place chicken breast in between a parchment paper or plastic wrap (or you can use a ziploc bag). Lightly pound the chicken using a rolling pin or meat tenderizer to even the surface. Discard plastic wrap. Season both sides of the chicken with salt and paper. Once the chicken breast are flattened, lay them down and top it with two slices of cooked ham and two slices of Swiss cheese. Then roll together the ham and cheese neatly. This will help stop the cheese from melting out. Place it on one end of the chicken breast and start rolling it in gently towards the opposite end. Secure the sides with toothpicks. Repeat the same steps with the remaining chicken. Set aside. In a low-medium hot pan or skillet, slightly toast the breadcrumbs with butter until it appears light brown. Next, season it then with Italian herbs, granulated garlic and onion, grated lemon and 1/2 cup of grated Parmesan. Give it a quick stir and set aside. Meanwhile, in a small bowl, lightly beat an egg and dredge in carefully the chicken rolls; making sure every inch of it is covered with the egg mixture for the breadcrumbs to cling to. Gently coat the chicken with the browned breadcrumb mixture. Shake off any excess breadcrumbs. Let it sit in the fridge for 10 minutes to allow the breadcrumbs to cling enough to the chicken. Then transfer chicken to the greased shallow baking pan and bake for 20-25 minutes or until browned and cooked through. Serve it with green salads for dinner or as pinwheels for appetizers. In a skillet or pan, melt butter over medium-heat and whisk in flour and cook until it browns – about a minute. Then slowly pour in milk while scraping the bottom or until flour is blended in. Add Dijon mustard, the remaining cheese, Worcestershire sauce and salt and pepper. Cook it for 3 minutes while whisking consistently until it thickens. Remove from heat and serve with the Chicken Cordon Bleu. Once the chicken breast are flattened, lay them down and top it with two slices of cooked ham and two slices of Swiss cheese. Then roll together the ham and cheese neatly. This will help stop the cheese from melting out. Place it on one end of the chicken breast and start rolling it in gently towards the opposite end. Secure the sides with toothpicks. Repeat the same steps with the remaining chicken. Set aside. In a low-medium hot pan or skillet, slightly toast the breadcrumbs with butter until it appears light brown. Next, season it then with Italian herbs, granulated garlic and onion, grated lemon and 1/2 cup of grated Parmesan. Give it a quick stir and set aside. Meanwhile, in a small bowl, lightly beat an egg and dredge in carefully the chicken rolls; making sure every inch of it is covered with the egg mixture for the breadcrumbs to cling to. Gently coat the chicken with the browned breadcrumb mixture. Shake off any excess breadcrumbs. Let it sit in the fridge for 10 minutes to allow the breadcrumbs to cling enough to the chicken. Then transfer chicken to the greased shallow baking pan and bake for 20-25 minutes or until browned and cooked through. Serve it with green salads for dinner or as pinwheels for appetizers. In a skillet or pan, melt butter over medium-heat and whisk in flour and cook until it browns – about a minute. Then slowly pour in milk while scraping the bottom or until flour is blended in. Add Dijon mustard. Followed by the remaining cheese, Worcestershire sauce and salt and pepper. Cook it for 3 minutes while whisking consistently until it thickens. Remove from heat and serve with the Chicken Cordon Bleu.